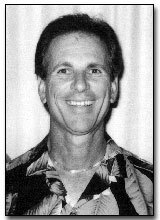 Dr. Jerry Bobrow was a force with Boys Baseball, Inc., of Fontana, as a coach, manager, vice-president and League president for 14 years. He also devoted more than a decade of active service to Westhills Baseball, Inc.
Dr. Bobrow has been a board member of the Jewish Community Centers Association and the West Valley JCC for many years. In 1984, he joined the Los Angeles Organizing Committee for the JCC's North American Maccabi Youth Games (Jewish athletes ages 13-16), and was chairman of that Committee from 1989-1993. He was responsible for sending Southern California youths to compete in Detroit (1990), Baltimore (1992), Cleveland (1994), New Jersey (1996), Detroit (1998) and New York (1999). Born in Rome, Italy, and a Californian since 1948, Dr. Bobrow was, himself, an outstanding track & field athlete at Fontana High School, and baseball star at Whittier College. He also pitched semi-pro baseball for nine years--once hurling 46 consecutive scoreless innings.